amazing company and my wish for Heartfelt Creations is many, many more years of beautiful "Art from the Heart"! Every day through the 17th, one of the Design Team blogs will be highlighted and there is a different prize to be won on each blog. Check back every day to the Heartfelt Creations Blog to find out where the music stops that day. Then, on the 18th a Grand Prize Winner will be selected. Here's the prize you can win here on my blog. All you have to do is comment on this post when the music stops here to be entered into the drawing! I've designed a beautiful card to celebrate Heartfelt Creations' 20th Birthday using the fantastic Fold Out Cards and the coordinating Fleur Border Basics Dies, the Elegant Border Basics Dies, The Regal Borders and Pockets and the absolutely beautiful Flowering Dogwood Collection. Other products used: ColorBox Mint Chalk Ink Pad, White Pearl Metallic Cardstock, Pink Pearl Cardstock, Misti, Hot Glue Gun, VersaMark, Silver Embossing Powder. I used the border basics dies to cut all of the paper from the Flowering Dogwood Paper Collection to cover the card base, inked the edges and adhered them with Dries Clear Adhesive. I then cut out all of the gorgeous lacy borders and adhered them. 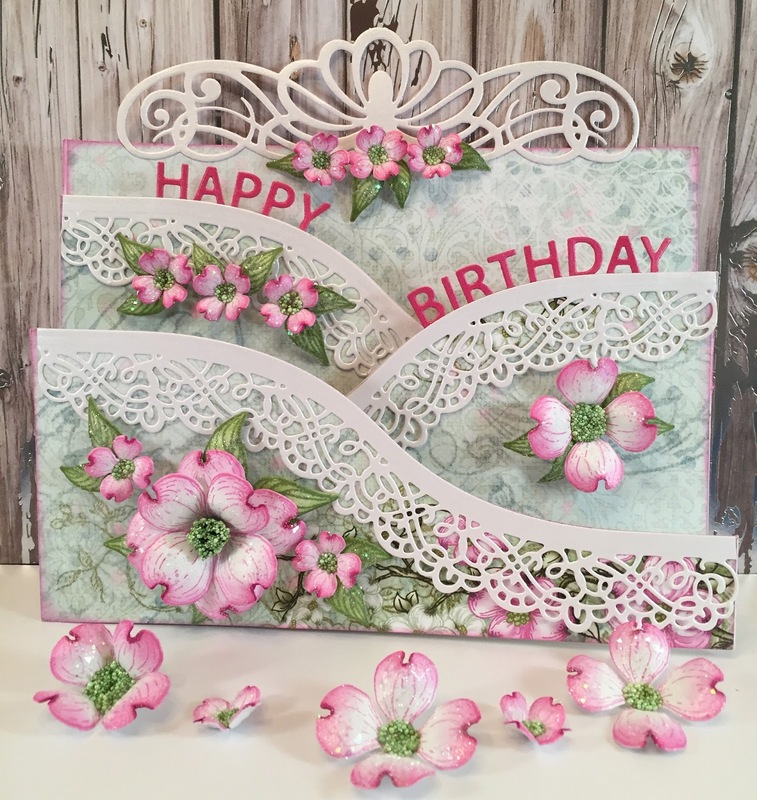 The beautiful Happy Birthday border comes from the Elegant Border Basics Dies. 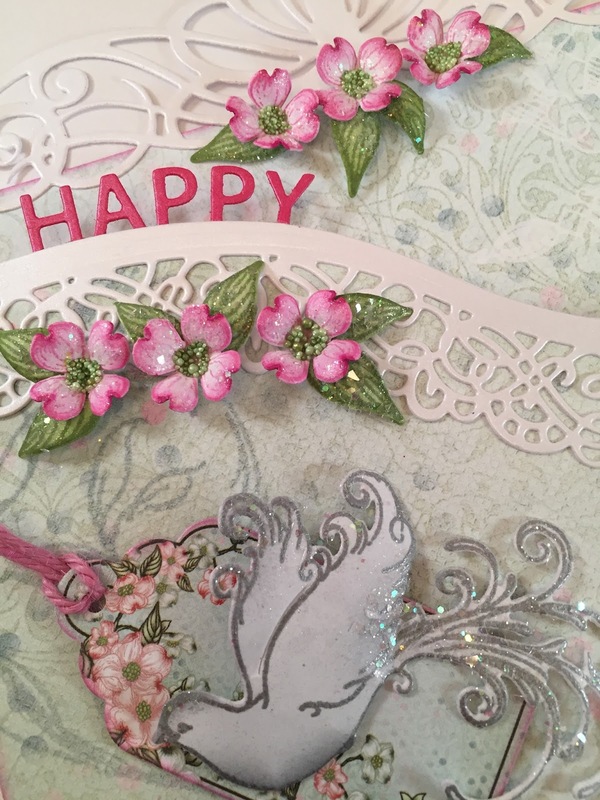 I then stamped, colored and cut out the Flowering Dogwood flowers and leaves, added glitter and adhered them to the card with my hot glue gun. The beautiful doves were stamped with VersaMark, heat embossed with silver embossing powder, cut out with the coordinating dies and adhered with Dries Clear Adhesive. The "It's Your Birthday" and "Let's Celebrate" sentiments come from the Classic Petunia Collection and were stamped with Brilliance Pearlescent Orchid Ink. The "Blessings" sentiment and the tags were cut from the Flowering Dogwood paper pad. Here's the list of the Designers who are participating in this blog hop. I can't wait to see where the music stops. This is so much fun!!! who the lucky winners are!!! NOTE: THE WINNER OF THE $25 GIFT CERTIFICATE ON MY BLOG IS WADE WALKER. CONGRATULATIONS WADE!!! PLEASE CONTINUE TO COMMENT ON THE OTHER BLOGS FOR A CHANCE TO WIN MORE GREAT PRIZES. Beautiful card Janet! Happy Birthday Heartfelt!!! Your card is stunning!!! I love the flowers so much...I live in Pa I believe those are our states flower.... I have been wanting to make one of these folding cards, I even bought the card bases, you are making me want to do it!!! The borders are so gorgeous!!! Beautiful! I like the way you used the border dies. Thanks for the inspiration! Love this lacey elegant card. Oh so pretty. The border dies are so elegant, I must have. Thanks for sharing. I love the movement in your design thank you . This card is so very pretty and inviting. Thank you! Beautiful card! Love the Dogwood flowers. Beautiful fold out card... love the papers you chose! Beautiful card!! Happy Birthday Heartfelt Creations!! So elegant! Thank you for sharing. Beautiful fold out card. Very creative, you've inspired me to try one. Beautiful card, love the fold out cards! Pretty card I love the doves! So so pretty!!! I've got some of the dogwood collection - and the doves are on my wish list for one of my next purchases. I love this cad so much. Thank you for sharing your inspiration!!! Oh my gosh! This is absolutely beautiful! I love this card!! Stunning fold out card, Jan! Fabulous! I love the card design and papers. The flowers are stunning! Gorgeous card, I love the edges and am going to have to try this fold! Another beautiful card. I get so inspired by all the wonderful ideas shared on the blogs. Love dogwoods and your are beautiful! Thanks for the inspiration! Absolutely beautiful! I love everything about it. Love your fold out card with those beautiful dogwood flowers! Beautiful details and colors! All of the curves, and the edgings are great. I like the little bit of glitter you used, too. NICE all the way around!!! Very beautiful card and flowers are perfect. Wouldn't know they aren't real. Nice coloring of the flowers. It sets them off so well. Great job. wow! what a great card. I love this card. I would love to make something similar. Happy Birthday HC! I love your card from the Dogwood collection. Each element looks stunning. Nice job. I LOVE your birthday sample AND your new Christmas!! Now that is one Gorgeous Birthday Card. Happy Birthday Heartfelt Creations. Wow!! what a delightful card this is, love your placements of those pretty flowers and those stunning border dies. Thank you for sharing. The fold out cards created by Heartfelt give you such a wonderful base to create from. The final piece is absolutely incredible. A great way to impress your friends and family. I love the simple elegance of your card! I love the different dimensions and elements you add to your cards. Definitely a keeper! Lovely work! Wow!! This is stunning!! Love the dogwood blooms. So pretty. Very elegant card. Absolutely beautiful card!!! Thank you for sharing. Oh my gosh!! This is absolutely stunning!! I just love the Flowering Dogwood collection! You showcase it so well with is card! These are beautiful thank you so much for sharing. Happy Birthday Heartfelt Creations! I love your products. Such a beautiful card, Thank you for sharing. Absolutely stunning! The flowers you created are so beautiful, I love the colors! The shaped design of your card looks amazing and you picked out the most perfect papers and embellishments! Very pretty! Beautiful card. Great color selects! Beautiful birthday card! Happy Birthday Heartfelt Creations! Happy Birthday Heartfelt!Love Heartfelt Creations products!!! Your card is stunning! I love those doves. Janet this card is so elegant!!! Stunning. 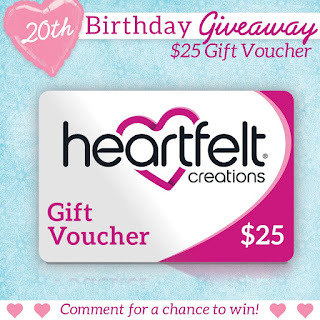 Would love to win anything from Heartfelt!!! This is my favorite collection of Heartfelt Creations, besides the Cascading Fuscias. Thank you for sharing your beautiful work. It inspires me to get crafting today. Wow. This is beautiful. I absolutely love it. Ahhhh. Another set to look at. Beautiful card! Love the fold outs. I love your creative card. It is so soft and delicate. Anyone receiving this beautiful card will treasure it. Brenda S.
Love, love, love the dogwood flowers!! Beautiful card. Beautiful card! I really love the fold out cards! You people at Heartfelt Creations never cease to amaze me with your beautiful creation. Thank You for inspiring me to want to keep learning. This birthday card is such an artistic piece! Anyone would be blessed to receive this and it's something to be kept forever. What a beautiful card. Thanks for sharing. Happy Birthday HC! Your card is stunning. Thanks for sharing! How beautiful!!! 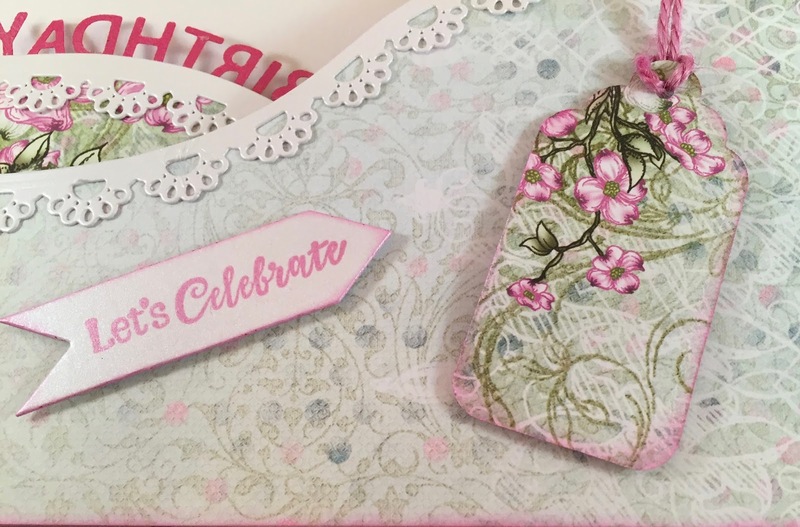 Lucky you to be an inspirational part of the birthday blog hop! What a beautiful card! Whoever receives it will feel very special on their birthday. BeautIful card and details! Thank you for thorough instructions and for sharing your talent! Absolutely lovely! Fresh and sweet! This card is amazingly beautiful and intricate. I'd like to know how long it took to complete. Oh wow!! Your cards are stunning. So much pretty! Oh those gorgeous dogwoods and fabulous edges!!! Both are on my wishlist! Congrats to Heartfelt Creations on their 20th anniversary!! Sure a pretty card you have created! 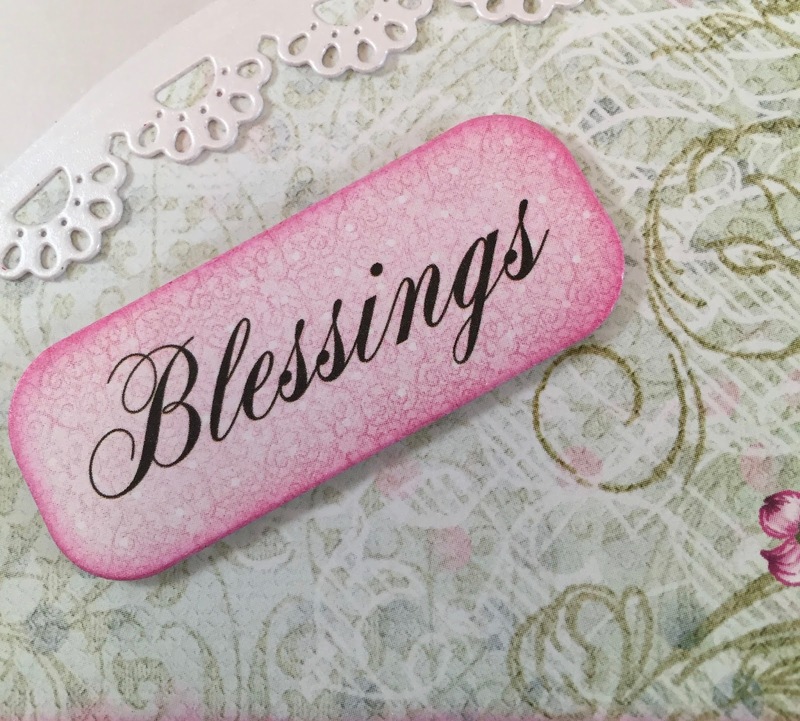 Beautiful card, Janet! Happy Birthday HC! Happy Birthday,Emma Lou! I love your card and can't wait to try my new Fleur border. LOVE your card! The pretty border really makes it stand out! Beautiful card! Love the ❤️felt products! Such a beautiful card!!! I am in awe of your skills with the flowers; I am still learning to properly shape flowers. Hi , love your use of the border dies and fold out cards, beautiful. How lovely ! Who wouldn't appreciate receiving card like this ?! Very beautiful card would love to start making my own cards. You are very talented. I really like this type of card. Yours is beautiful. Beautiful ideas and love these products. Ever since I first saw them at a craft show, I feel in love with the designs and flowers. Your card is gorgeous!! Stunning job! love the card design! What beautiful cards. Love all that are here. Soooooo beautiful! I'm not very good in card making so I'm always stunned by gorgeous and complicated card. Such a gorgeous card. Thank you for sharing. The Dogwood Collection was my first introduction to this beautiful art so this card really is special to me. And it is also special how much your talent shows in the work you have done. Thanks for celebrating the two-decade birthday of such a wonderful company as Heartfelt Creations. Your cards are beautiful Janet! I love the Flowering Dogwood collection. So beatiful. I used mine to help a friend decorate her wedding cake and centerpieces for the tables. I love Heartfelt Creations! Happy Birthday and may there be many more in the years to come! I love the curved layers. The way you used them is striking. They are such a versatile set. Creativity at its best. Thank you for another 'show stopper'. Love your work!!! I don't know which card is more beautiful! Gorgeous card! Have a fantastic weekend! Love the card Janet beaitiful. I have to say the Dog Woods are one of my favorites. Love all the color in the cards. A glorious card for a celebration! Heartfelt is such a wonderful company! I commented on Facebook but had to come to your blog for some close ups! This card is simply STUNNING! I love the soft colors and gorgeous flowers! Beautiful use of the border dies. I love Heartfelt Creations! Beautiful card! Just got my Floering Dogwood stamps and dies in and can't wait to play with them. Love all their products!!! Absolutely stunning, as always! Your work is flawless and so beautiful! What a lucky person to receive this card! Just love the splashes of pink! The really make this card pop! How awesome! That card is beautiful!!! Beautiful work. Love it all. Outstanding card. Love the borders that really complete the elegant look but my favourite is the dogwood flowers! Omg!!! !Your card touch my heart. So beautiful,awesome job. I send this message from my husband Shawn account. I couldn't send from my name. What a stunning card! Anyone would be lucky to receive it, but if I had created it might not get sent. Beautiful work. Beautiful card! Thanks for the list of supplies and detailed pictures. I will definitely be Case-ing this card. Love it! The card is truly beautiful and intricate with the lacy borders - I cannot get enough of Heartfelt creations, I am blown away by all the options and colour coordinations, each card looks like a masterpiece. Happy 20th! Love your card heartfelt is very nice products. The Dogwood collection is a personal favorite of mine. Your card is so beautiful and delicate looking. Thank you for your creation. Beautiful!! You are so talented. Thank you for sharing!! Very pretty. Happy birthday Heartfelt!! Great inspiration. Absolutely Beautiful Card! Love It & Happy Birthday Heartfelt Creations!! The Flowering Dogwood papers are my favorite. Nice job on your card! My favorite detail of your inspiring Heartfelt Creation Birthday card is the triple mini dogwoods on the left and at the top of your card. So sweet looking! Thank you for sharing your work! Another gorgeous creation with HC products... love it! Happy Birthday Heartfelt, love your products and amazing customer service! Love the foldout cards! Your flowers are so pretty! Thanks for the chance to win! Oh My God! Super work. U r very creative and talented crafter. Dogwoods are so pretty! Thank you! 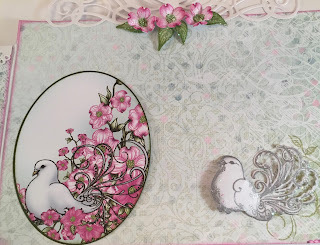 Stunning card using many of my favorite Heartfelt Creations products. Love the delicate border on your card, very nice! Very lovely card with that HFC flower. 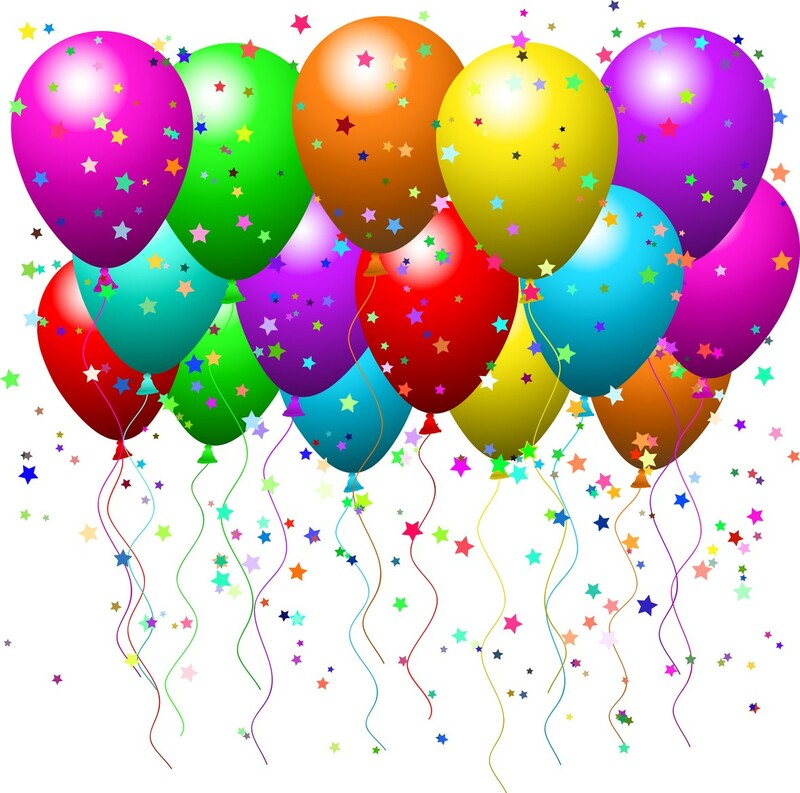 Happy birthday HFC! I love love love this card!!!! !